"What a bizarre day. I'm sitting here watching my email fill up with message after message from people from so many different times and places of my life, all congratulating me for the astonishing good fortune of receiving a MacArthur Fellowship. Not to mention a flurry of texts and tweets, and I haven't had the energy to even look at Facebook." 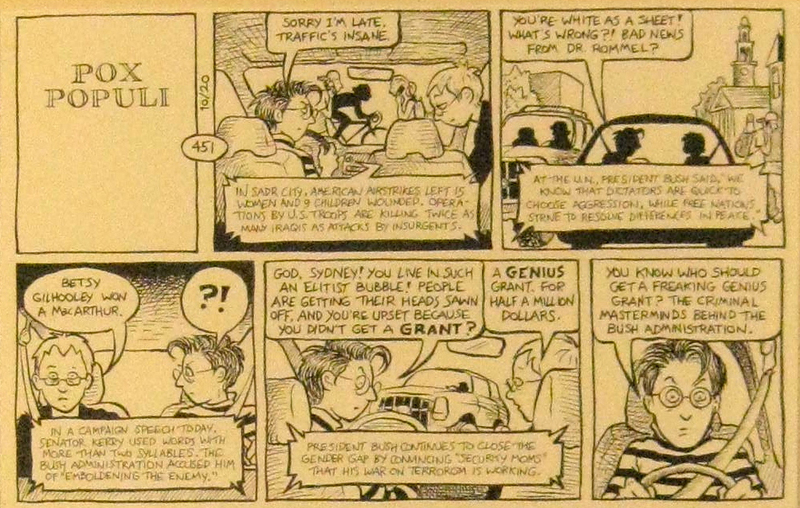 Cartoonist and Graphic Memoirist Alison Bechdel (previously on MetaFilter: 1, 2, 3, 4) has won the prestigious MacArthur Genuis grant, giving her the opportunity to dig into her archives for a previous comic she drew in 2004 to conclude her reaction blog post. To mark Banned Books Week, and to celebrate the occasion of a fellow Vermont resident receiving this grant, MeFi's own Vermont-residing Jessamyn West [retired] made a video (and plays the ukulele) honoring Bechdel (who lives in Bolton, Vermont). The video is hosted on the Vermon Library Association's YouTube channel. Banned Books Week (previously on MeFi, and on Twitter @BannedBooksWeek, using the hashtag #bannedbooksweek) is an annual coordinated event to celebrate the freedom to read, and takes place September 21 to September 27, 2014. More about Banned Books Week. The fellows receive $625,000 over five years, with no strings attached. "It will give me a lot of security that I don't have. Pay off some debts, save for retirement – really boring stuff," says Bechdel, who lives in Vermont. "I've been a cartoonist all my life!" Of late, Bechdel has become a household name for popularizing the Bechdel Test, a three-part challenge testing whether a film or book a) has at least two women, who b) talk to each other d) about something other than a man. Originally considered "radical, feminist, lesbian" when she wrote it more than 25 years ago, Bechdel now says of its acceptance, "The mainstream has caught up to radical feminist thinking." In the above linked piece, Bechdel – who is currently on artist residency in Italy – calls the grant "an incredible gift." Alison Bechdel's website, blog, Facebook page, Twitter (@AlisonBechdel), and YouTube channel. I am so, so, so, so happy for her. Even if "all" she'd ever done was DTWOF, she'd have a fantastic legacy -- but Fun Home still bowls me over with how great (and tough) it is. Which reminds me I still need to read her latest. I squealed when I saw the news on Twitter. Awesome. Fun Home is very, very likely to win the Best Musical Tony Award this year as well. I hadn't seen much of DTWOF, but had read and loved Fun Home and Are You My Mother? I finally did get the omnibus book of DTWOF last week and she's right; a lot of the stuff her characters were discussing in the 90s/early oughts, that were way out for a lot of folks, are stuff that I see all the time here and on Tumblr and lots of other spaces. Of course, I think the appeal of that strip is how normal the characters are. Even a couple composed of a bi-sexual lesbian* living with a dude and raising a child together (with him staying at home) have pretty much the same fights and domestic issues as your average hetero couple. I may have done a Kermit flail when I saw the news that she had won. I read DTWOF for many years and often wonder what the characters would think about the events of the last few years, and what would've happened to them. Thanks for this. I pretty much fell out of my chair when I found this out on the day the news broke. And younger-me - the one who felt her life was chronicled so perfectly on DTWOF, back when it was only in the alt weeklies and the queer papers and mags - is still slack-jawed in amazement. I don't peer into the intellectual realm very much but the Bechdel Test is something I carry out all time. With [very] few movies passing. I am so, so psyched for her! I keep hearing good things about Bechdel and DTWOF, usually with only a passing reference to her eponymous test, and as a fan of comic strip serials I think it's time that I gave it a look-see. Is there a comprehensive online resource for DTWOF strips, or will I need to buy actual made-from-paper-usually-stored-on-a-bookshelf books? If I need to buy books, is this volume the one I should start with? Oh, also, is the comic as it exists today comprehensive, or have some strips been lost? Because lost strips -- particularly if those strips advance plots or storylines -- would run afoul of my obsessive compulsive disorder... which is the reason I don't (for example) watch Doctor Who. She did a neat blog post about a week and a half ago, showing one of the things she was working on during her Italian residency: diary drawings on a giant scroll of paper. Really interesting to see. It's honestly about time someone gave Alison Bechdel a boatload of money. Is there a comprehensive online resource for DTWOF strips, or will I need to buy actual made-from-paper-usually-stored-on-a-bookshelf books? The comic as it exists today is semi-comprehensive - I think all the actual sequential strips are collected, but she also did a lot of little one-off things with the characters here and there. Only some of her strips are online. The very first book, IIRC, has some pre-Mo material. I read those between something like 1990 and the end of the strip, so I felt like I knew those characters. The cumulative effect is huge, as is seeing how the drawing and writing get stronger. I think that if you're a completist just beginning at the beginning and then going on to the end is the best approach, but if you're not a completist, jumping in with Split Level might be a good starting point - it's very coherent, she's nearly at the peak of her powers drawing- and writing-wise, the story is maybe the most relate-able for people who are not queer women. It's just an excellent strip. I was absolutely heartbroken when it ended. Are You My Mother? is better than Fun Home, IMO. I would not be who I am today absent DTWOF. Even now, it's sort of difficult for me to realize that it isn't actually a major, major strip that everyone has read; it's simply streets better than the vast majority of serialized strips. I should really try DTWOF again. I love Fun Home but I found DTWOF didactic when I read it back in the '90s. The Confessor, the Essential book is the one I read, and while it doesn't include every strip ever, it does have a good forward by Bechdel and the strips were chosen by her, so if you wanted to jump in, I would think it would be a good place to start. I got it used for 10 bucks. pxe2000, yeah, there is that; what I noticed is a lot of strips have the personal plotline going on (relationships/work/whatever) and then a tv/radio commentary going on in the background that is definitely more didactic (and dated, in the same way that old Doonesbury strips are). What I found was that I read for plot the first time and ignored the political commentary, but on re-reading did take it in and enjoyed her little jokes on the TV and in headlines and backgrounds. The character of Mo does lecture a lot, and I do kind of skim a bit to whatever the plot-relevant bit of what she's saying. Bechdel did me a solid back in the day (2002?) when I co-edited Revolting Librarians Redux with KR Roberto. She allowed us to use one of her comics "Mo Goes to Library School" (or something similar) for free. Very cool of her. Since moving full-time to Vermont I've become even more of a fan. She's very good at what she does and personable enough without being a showboat about it. Fun Home in many ways mirrored my life (a bunch of people growing up separately in a weird house together) but I could not get into a groove with Are You My Mother, maybe because it was too close to home and maybe because I can't connect with other people's therapy very much. Anyhow, I was stoked about this, both for Alison who totally deserves it, and her ideas and art which deserve a wider audience. After you've read DTWOF for a while and you get used to a strip that's basically about women with a bunch of men in usually-supporting roles you totally get how unfair and unreasonable it is that most comics are exactly the opposite. Thanks for this post. It's interesting - I feel like Fun Home is structurally kind of about patriarchy - it's more clearly delineated, cause and effect match up, the plot wraps up much more neatly (partly because her father is dead) - it's rational, it breaks neatly into parts. Part of me reads it as "this is a story which could be resolved by the guy simply not having to be in the closet and therefore not having a miserable and trapped marriage; this is a story about a person confined by a single, tidy, unfair stricture". AYMM is much messier, because AB's relationship with her mother is ongoing and because it's difficult to say "this one thing would have fixed so much". And I feel like the therapy stuff is about enmeshment with the mother...there isn't nearly as much sense of AB's mother as this autonomous person. It's a more abject book, like it's structured to be about French feminism of the eighties. I find it much more uncomfortable than Fun Home. AYMM doesn't seem to be as much retrospective about youth and childhood as about this messy continuation of them. They are both such terrific books. Aw, I got some small tears in my eye from how hard I smiled when I read this. So richly deserved. Because of coming of age with Dykes To Watch Out For in the background of basically my entire gay life, it felt like (and continues to feel like) a dear friend received a MacArthur Fellowship and I have to keep reminding myself that I don't actually know Alison Bechdel. Aaahhh, yeah, I couldn't agree more. Some of my friends have responded to this with "eh, Fun Home was only okay and I didn't even like Are You My Mother? ", which just floors me, even beyond the fact that I thought they were both fantastic--she started paying her dues writing DTWOF during the Reagan administration. I found it as a high school freshman circa 1994 (along with, um, Hothead Paisan) and even then it seemed like a kind of cultural touchstone. Yeah, I have the same thing going on, MCMikeNamara - she and her characters were around all the time in the DTWOF strips in the gay newspapers I was reading in the late 1980's and after, and the comic felt so biographical that I felt a bit like I knew Alison given that I knew Mo so well. (Also, I was one of the countless fans who kept the idea of the 'Bechdel Test' (Mo's Movie Measure) alive and shared it with lots of people after having read the strip back in the day.) Hearing that she'd won the Fellowship made me literally make squee noises on her behalf, as if someone in my extended community had gotten it. I *loved* "Fun Home" - it felt like all the work she'd done with DTWOF had somehow mutated into training that had led her to this weird synthesis of awesomeness. Plus, oh God, I saw things that were so familiar in the proto-dykeliness of young Alison. I also enjoyed "Are You My Mother" - that book felt less 'struck with a lightning bolt' and more literary, with it's level of meta and the way it seemingly looped back and around and into previous media. But I think "Fun Home" struck me more deeply. This MCMikeNamara!!! This is almost exactly what I was going to write! I'm so happy for her. The last time I saw Bechdel at a speaking engagement, someone in the audience was like, "you know, I love your longer stuff, but you should do Dykes To Watch Out For Again!" and she was like, "yeah, that'd be fun. Can you tell me how exactly I would make money off that?" and there was an awkward silence. So! I'm glad she got some cash here. She deserves it; she's a great cartoonist! The New Yorker website republished a profile of Bechdel from a few years ago. Her personal memoirs sound pretty interesting. I've recently re-established contact with a friend I knew 20 years ago; he went to college with Allison Bechdel, and we met right when she was starting to get going and he was always proud of having "known her when". He moved to Singapore shortly after we lost contact 20 years ago, and he kind of fell off the pop-culture radar. But he kept up with her work. During a web chat we had last month we were talking about the state of female characters in movies, and he started saying "oh, so there was someone I went to college with and she had this comic strip where two of the characters came up with a theory about women in movies - "
"Oh, I know about the Bechdel test," I told him. And I told him about how yes, I knew about the comic, and so did other people, and how that one line had become a pop culture rule of thumb. "Seriously, Google the phrase 'Bechdel test' and see how many hits you get." His shock at discovering that she'd become a meme was visible even on my crappy little iPad mini screen. I sent him a link to the MacArthur fellowship announcement. He hasn't responded yet, and I'm starting to think he may have exploded from glee. I remember learning what "PC" meant circa 1990, from a DTWOF strip where Mo was prepping for a date (with Harriet?) and rejecting outfits for various reasons. Like a lot of folks, my queer identity was bolstered and validated by reading her strip. In the pre-internet age, it meant so much to see other queer women (especially of color) going about their lives, falling in and out of love, talking politics, challenging and nurturing and supporting each other. This really does feel like an old friend has won this award. There's no dust in the room, no onions - I'm literally weeping with whatever that mix of joy and sorrow is. I'm so proud of Alison Bechdel, and so grateful to her. You guys, if you get a chance to see the musical when it arrives on Broadway, please go. It's wonderful. I only know Bechdel from Dykes To Watch Out For, which as a straight man I nevertheless found to be mostly accessible, funny, and often insightful about humans in general. Good on her for winning the award, and I hope she uses the money to do something cool. I am shocked, and annoyed that I am shocked, that her books were banned at colleges. Colleges? I think of books being banned in elementary schools (which is bad enough). They're banning books at college now? I love Fun Home but I found DTWOF didactic when I read it back in the '90s. I can see that. But there was a time when being didactic was a necessity. And there are times now when being didactic would be worthwhile. The Confessor, THIS BOOK is the one you want, if you want to begin the complete DTWOF experience. (It is out of print; I paid $50 for my copy a few years ago, the most I have ever paid for a non-textbook, and it is totally worth it.) Then, you want Split-Level, Post, Carbon-Based, and Invasion, in that order. Then, finally, you pick up this to catch the remaining strips that were never published in a smaller book, and it goes to the end. As a supplement, the book that Halloween Jack recommended (also out of print but easier to find used than the big collected volume) is awesome, and I think captures all the one-offs that are out there pretty well. Bechdel is currently one of my favorite people in the media. I was so happy about the MacArthur.